Why do I blog? I get asked this question alot. It's a question I can't really answer beyond the fact that I really enjoy it. I really enjoy the process of cooking and sharing with a community. There are parts of blogging I like more than others. I'll be honest; writing is not my strong suit. I do however love the photography; both taking photos and editing them. I want to learn more. For me, blogging is a hobby I guess. I say "I guess" because I wouldn't necessarily turn down a good financial opportunity if it came my way. The thing is that I am not ready to sell my blogging soul to the corporate sponsor. I have at various times tried advertising, but the $3.13 I made didn't really seem worth having ads cluttering up the space. I do provide amazon links to the cookbooks I cook from, and if someone ever bought a book through that link I guess I would make a little something, but that hasn't happened yet. I like the idea of convenience that the book is just a click away if you were interested in ordering it, although I have to say that I would prefer you buy it at your local bookstore. The reason I am telling you this today is because I am really excited about these beans. I don't want you to think that someone paid me to say these are the greatest beans. Really, they are the best little beans I have ever tasted. They are White Tepary beans from Rancho Gordo. They are rather small, but they hold their shape well. I have a tendancy to cook my beans too long, so I am always happy when they hold up to my abuse. Never before have I cooked a pot of bean and then proceeded to eat them straight from the pot, unadorned. There is something slightly sweet about them. 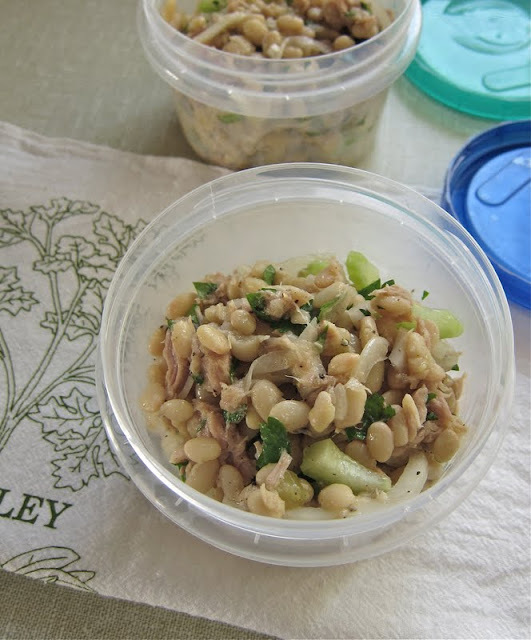 They were perfect in this Italian Tuna Salad. While I am telling you about the beans from Rancho Gordo I also wanted to say that their cookbook is amazing too. I have owned this book for over a year and had not cooked anything from it until David's birthday about a month ago. You see I am trying to make some space on my bookshelves by possibly getting rid of some cookbooks I don't use. The plan is to at least give them a chance before I send them on their way. Now I am sorry I didn't start cooking from this one sooner, even if it doesn't free up any room on the bookshelf. Place the tuna in a salad bowl and break it up slightly with a fork. Add the onion, celery, parsley, and beans. Drizzle with the olive oil and vinegar. Season with salt and pepper and toss well. Taste and adjust the seasonings. Serve at room temperature. We took ours hiking and didn't eat it for several hours, although it was a pretty cool day. I also refrigerated and then took it to work the next day and let it come to room temperature before eating, that was also very good. * Runner cannellini or any other mild white bean will work here. 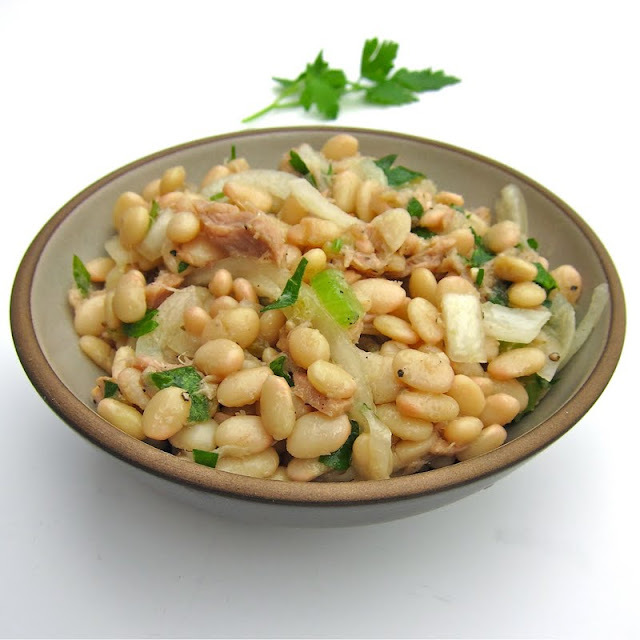 Another option is flageolet or marrow beans. Our lunch for a day hike on the Chena Dome Trail. I for one, am so grateful for all the hard work you do in maintaining your blog. And it is work, even though it's something you do for your own enjoyment, and you receive no income from it. I love your gorgeous photo's of course, but also the honesty in your writing and the wonderful recipes you share. Thanks so much. I love your blog. It's very honest, and the honesty comes across like it's a part of your personality. Very refreshing. I am with you on corporate sponsorship. I've already had offers, which is surprising, and when I turn them down I always feel a pang of "but what if..." except I know it's really, really not what I'm about. Oh yum! This looks wonderful. Thank you for continuing to share.